Older Belarusians nostalgic for the Soviet past rather than youth make up President Alyaksandr Lukashenka’s natural electorate. Since the late 1990s, Lukashenka has put considerable effort into building support among younger people. A key role in the process was played by the Belarusian Republican Youth Union (Belorusskij Respublikanskij Sojuz Molodeži, BRSM). BRSM was established in 2002 as a merger of the Leninist Communist Youth Union (Komsomol) and the Belarusian Patriotic Youth Union. From the very beginning, the organisation was given opportunities for development and state support unlike pro-opposition youth movements. BRSM reportedly received 4.5 million dollars in 2013, and 6.61 million in 2011. The organisation’s funding has exceeds the amounts available to the official TV channels. 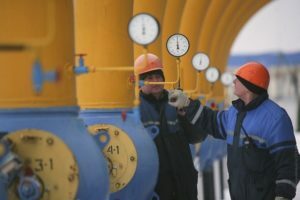 Although the President has repeatedly suggested that the organisation should become self-sufficient, BRSM’s subsidies have continued year after year. Today the organisation counts more than 500,000 members. It created its own lottery (Unost) and operates a radio channel (“FM Pilot”) as well as several newspapers (“Znamia Unosti”, “Perehodnyj Vozrast”, “Zor’ka”). The organisation’s information bulletin boards have appeared in every school, college, university, and military unit. Anyone between the ages of 14 and 31 can join. The majority of BRSM “friends” (i.e. 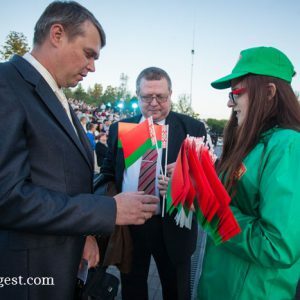 members) are students in 10th or 11 grade who know little about the organisation’s ideological role in Belarus. “Friends” are often recruited collectively in a classroom setting. Some students mindlessly sign on following teachers’ encouragement. In some instances, they do not even realise that they are becoming BRSM members. Secondary school students are often told that their “membership” will facilitate getting admitted to a university, securing a place at a good dormitory, or obtaining some other benefits. In most cases, these are empty promises. Instead, BRSM membership results in additional obligations, such as participating in mass demonstrations on state holidays or competing in state-sponsored sporting events. There are also young people who have joined the organisation intentionally. Some of them support Lukashenka’s policies while others hope that membership will facilitate career advancement, especially in state bureaucracy. 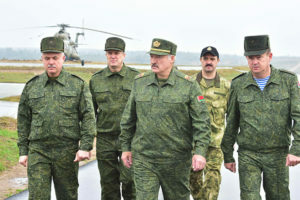 Lukashenka has often noted that the organisation serves as a good source of new cadres for the state apparatus. The first secretary of BRSM Ihar Buzouski is a son of KGB colonel Ivan Buzouski. In 2015, 42-year old Ivan Buzouski was appointed deputy head of the Presidential Administration. 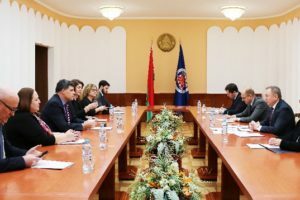 He also serves in the upper chamber of the Belarusian parliament, the Council of the Republic, while at the same time continuing to lead BRSM. The organisation also competes for domestic ad international grants and frequently wins, in part due to its large membership and wide coverage. BRSM members pay small membership dues and many obtain help with finding construction jobs in the summer to pay their own bills. 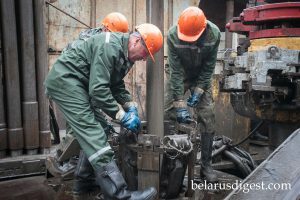 For example, BRSM members participated in the restoration of the Augustovsky Channel, the construction of the National Olympic Committee building, and the Astravec nuclear power station. 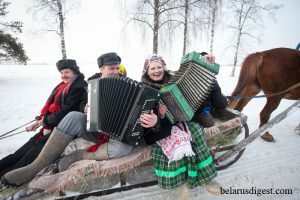 According to the 2010 opinion poll by IISEP (Independent Institute of Socio-Economic and Political Studies), 64 percent of the Belarusians know about BRSM and 37 percent of them view it positively. As many as 20 percent of respondents said they would agree to participate. For comparison, only 8 percent of respondents knew of Malady Front, the best-known pro-opposition organisation in the same poll.